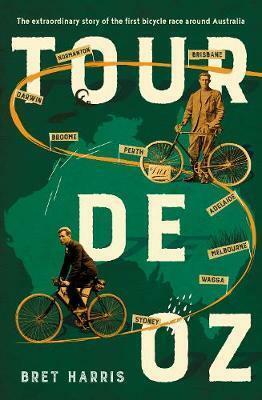 Four years before the inaugural Tour de France four Australians set out on a bicycle race around Australia. On 24 November 1896 a wiry and wily busman call Arthur Richardson, left Coolgardie for Adelaide by bicycle. Carrying only a small kit and a water-bag, he followed the telegraph line. After much sweating and swearing on sandy roads west of Eucla, and enduring the scorching heat of the Nullarbor, thirty-one days later he arrived in Adelaide becoming the first man to pedal the Nullarbor route. But within two years, Richardson had set his sights on being the first person to ride round the vast continent, not yet a nation, and some 18,507 km. On 5 June, 1899, he left Perth heading north, carrying no more than swag and a pistol. Heavy rain slowed his progress in Western Australia, and later in the north, where the black-soil plains were unrideable for several days. He had to push and carry his bicycle through much sand, and encountered aboriginal warriors across the north. But he also had company... another party of cyclists with the same ambition. Melbourne brothers, Frank and Alec White and adventurer Donald Mackay from Wallendbeen Station, were attempting the ride in a counter-clockwise direction from Brisbane. Set against the fledgling pastoralist empires of pre-Federation Australia, TOUR DE OZ is the extraordinary true story of a remarkable ride to circumnavigate the vast Australian continent - before we became a nation.